The High Tea Society is an accidental masterpiece. Well, not completely accidental. It’s just that the website’s founder, Michelle Milton, never really expected her creation to turn into such a runaway success. With an audience of 70,000-plus, the High Tea Society is a content marketing case study: how to build an audience, turn them into a community of raving fans, and turn the whole gig into a money-making venture. Milton, who trained in PR and marketing, got a lucky break early in her career. Back as far as 1995, when most of us didn’t have email, Milton’s employer trained her in HTML and she started building websites. When she chucked it in to travel, her training landed her a great job at Westminister University, training traditional advertising agencies in the new digital skills. When the bust hit and the fun evaporated, Milton returned to Australia and began freelancing as a digital marketing consultant. In 2009, when interest in content marketing began, Milton began the site to teach herself the ropes. She started The High Tea Society as a test site and case study. It’s the choice of topic that proved serendipitous. Milton loves high teas. And she uncovered fellow fanatics the world over. She turned this crusade into the content for her blog, and it has proved a rich vein. 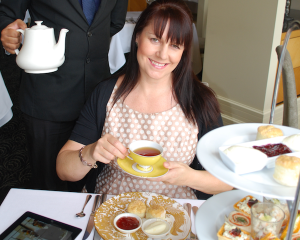 Milton has uncovered more than 200 high teas on offer across Australia and New Zealand. A year into the project, a story about The High Tea Society featured the website of Australia’s multicultural TV brand, SBS. Interest bounced. Milton’s site grew in popularity, as did her Facebook community. “That one story on the SBS website turned it into something completely different. I got so much exposure; so many people looking to make contact,” Milton says. Then one venue contacted Milton and offered to supply a prize if Milton ran a competition. The event was such as success that it has become the business model for the site. Regular sponsored competitions, targeting a segment of the active and engaged fans on her database, bring in about half of Milton’s annual revenue. The remainder comes from her digital marketing consultancy. In the past two years, electronic direct campaign (EDMs) have become more important for revenue than running competitions. Restricting the number of competitions to about 15 a year keeps their value high, and doesn’t saturate subscribers. “The value is better if I run fewer competitions at higher value,” Milton says. “Then, when the email list got big enough to segment it, it just offered a better marketing solution.” Milton charges a set-up fee per EDM and then a fee per email. Most campaigns cost between $1,000 and $3,500 each. The content marketing model demands businesses put their audience first. Milton keeps the site’s credibility and independence by reviewing only the venues that have a good quality product. If she doesn’t like it, she doesn’t review. Milton’s fans keep her informed of new venues, closures, or venues that fail to keep their standards high. They provide leads, and they provide buzz and excitement around her brand. Milton’s reach of close to 70,000 is spread across the different platforms: 18,700 email subscribers; 40,000-plus Facebook fans, and 6800 Twitter followers, as well as about 3000-plus Instagram devotees. A keen photographer, Milton makes sure she documents the ambience of each venue. About 80% of her following is in Australia, but she has international contributors and reviews of many international venues. In no small measure, Milton’s website helped spark a global travel phenomenon. The power of content marketing.